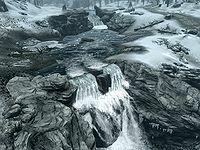 The River Yorgrim is a river flowing from Lake Yorgrim to Windhelm. Anga's Mill is located along the river. A bridge is located near the mill, and is the only crossing point on the river. It joins the White River at Windhelm. This page was last modified on 17 June 2013, at 19:13.